This appears to be an easy recipe but many top chefs are judged by their ability to execute the perfect omelette! At home you can insert a little gruyere cheese or sliced ham, but we like it simply adorned with some beautifully fragrant herbs. We are going to cook the omelettes two at a time, using 2 eggs for each. Break the first two eggs into the small bowl and whisk lightly with a fork. Add the chopped herbs and season with salt and pepper. Weigh the butter & cut off a quarter. Heat that quarter of the butter in the 1st frying pan over medium heat until foaming. Once the foam dies down, pour in the egg mixture and gently rotate the pan to distribute. Cook for 20 seconds or so, until it begins to bubble, then draw the egg into the centre with the wooden spoon and rotate the pan again to redistribute the uncooked egg. Break the next two eggs into the bowl and continue as for the first lot. 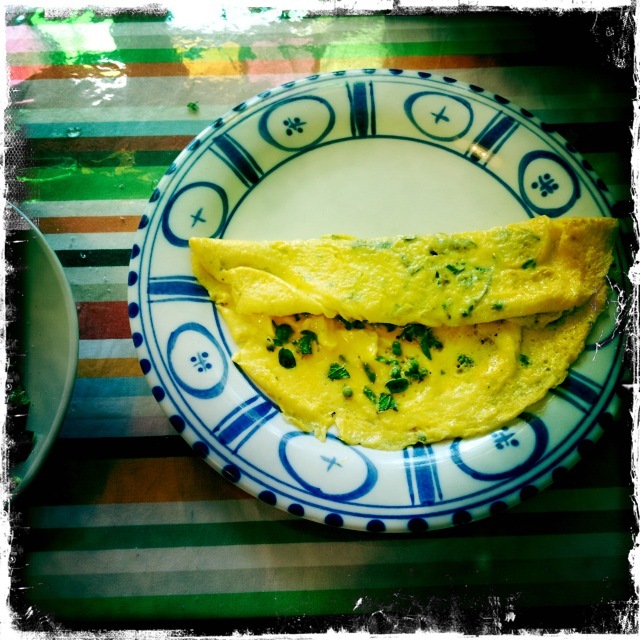 The omelettes are cooked when the base is set, but are still slightly runny in the middle. Remove the pans from the heat and fold 2 sides of each omelette into the middle and slide out onto your serving plate. Repeat. Notes: What does redistribute mean? Why do we leave the omelette slightly runny in the middle? Where does the word omelette come from? Artichokes are such a prehistoric-looking plant, with huge leaves and forbidding-looking flower buds… but they are truly delicious once you know what to do with them! Fill the stockpot with water & set to boil on high heat. 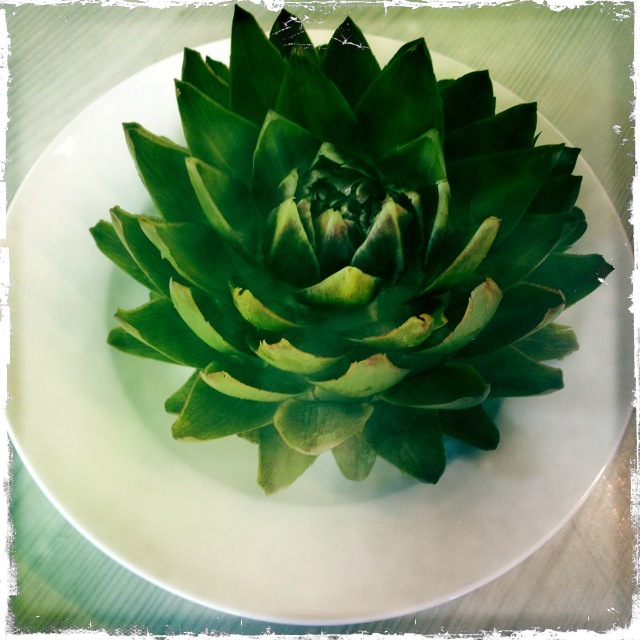 One by one, hold each artichoke on the edge of the counter with the stem overhanging, and quickly snap it off the head. Pull the straggly & older leaves off and check that the artichoke will sit up straight, trimming the base if needed. 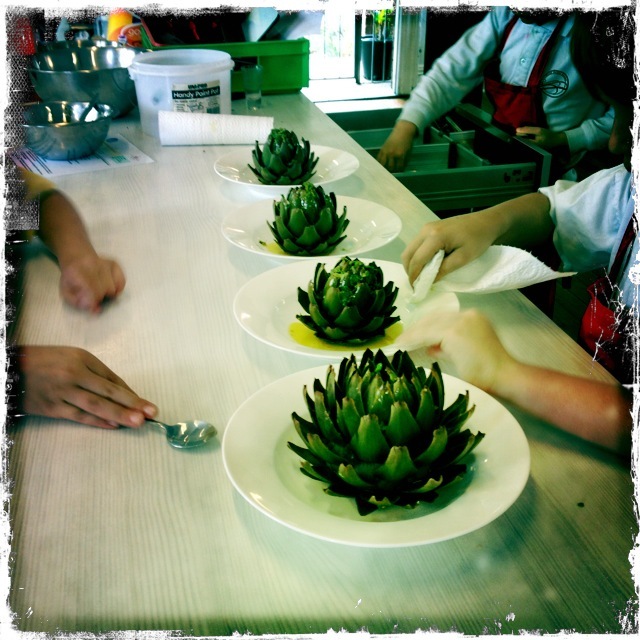 Add a tablespoon of cooking salt to the water when boiling and add the artichokes. Wash your hands to remove the bitterness! Cook for about 10 minutes (a little longer for the big ones) and then check the base with a skewer to see if tender. Remove when done using the tongs and drain upside-down in the colander. Meanwhile, peel the garlic clove and put it in the mortar with a large pinch of salt. Pound to a paste. Juice the lemon and add the juice to the mortar (without pips) then stir the lot with the teaspoon and scrape it into the large bowl. Stir in the oil and grind some pepper, then whisk the dressing lightly. Wash, dry and pick the thyme leaves and then add to the vinaigrette. Place each artichoke in the centre of each soup plate and drizzle the vinaigrette over the top.To eat, pull each leaf away from the artichoke and dab in the vinaigrette. 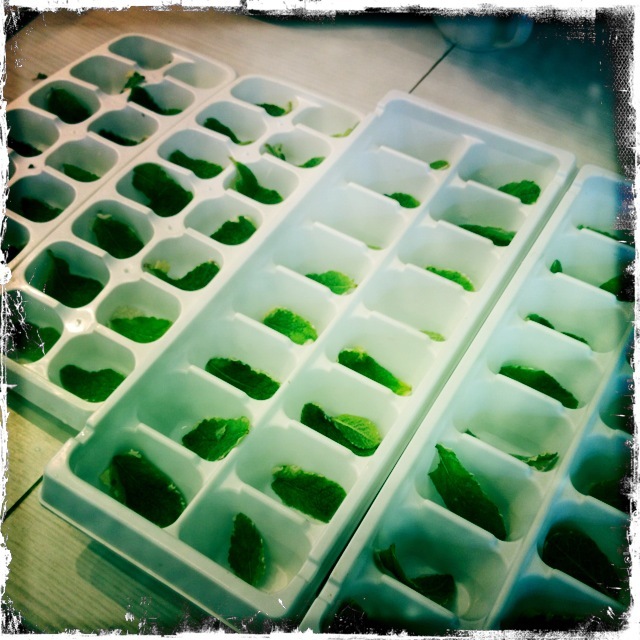 Scrape the bottom part between your teeth, and then discard the leaf. Once you near the middle and the super-tender leaves, you can remove them in a clump to expose the ‘choke’ – scrape this off carefully with a teaspoon and discard to reveal the best of all – the heart, soaked in all the left-over juices! Yum yum. Notes: What sort of plant is this? How else could you eat it? Why don’t you eat the choke? What makes your hands bitter? What else can be made from artichokes? 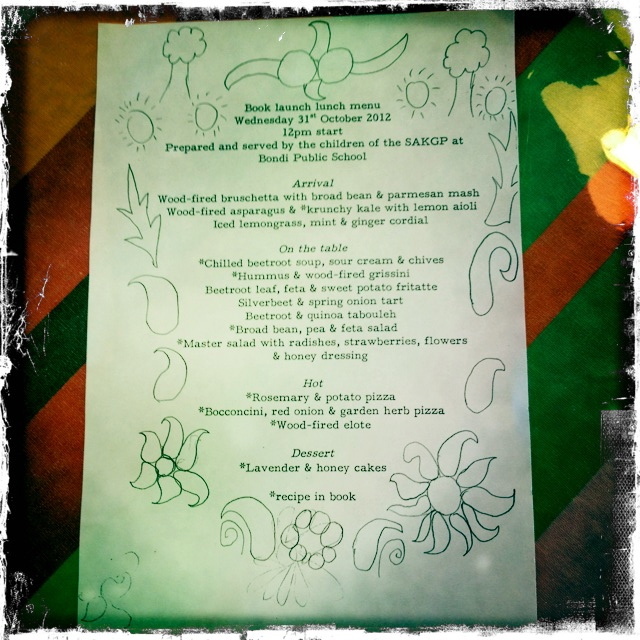 Next: the book launch! 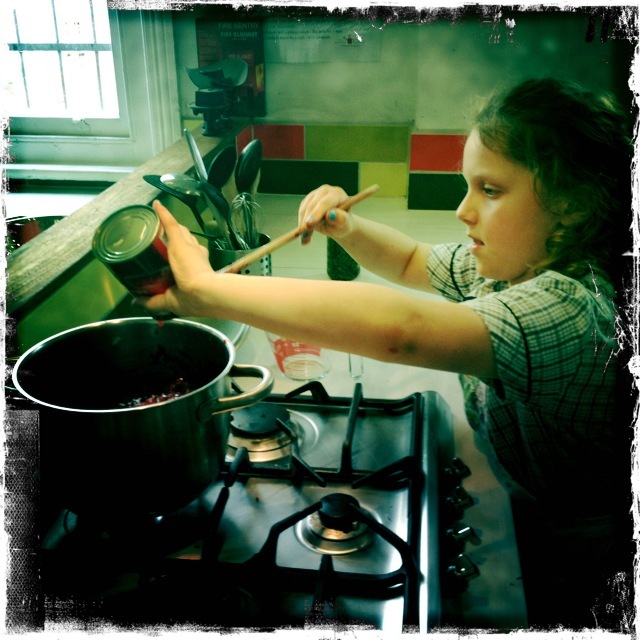 We had around 75 children and 27 adults contributing their time and skills to the relentless roster of prepping, cooking, serving and shepherding – the atmosphere in the cottage was akin to a harmonious 5-star hotel kitchen (with chefs of a diminutive stature) and helpers up to their eyeballs in instructions… I need to say another MASSIVE thanks to all the helpers, and especially to Rosa and Phillip who gave not only bricks and mortar but also time and sweat in the midday sun to contribute to our success! All our VIP guests & press loved everything and the day was fantastic. 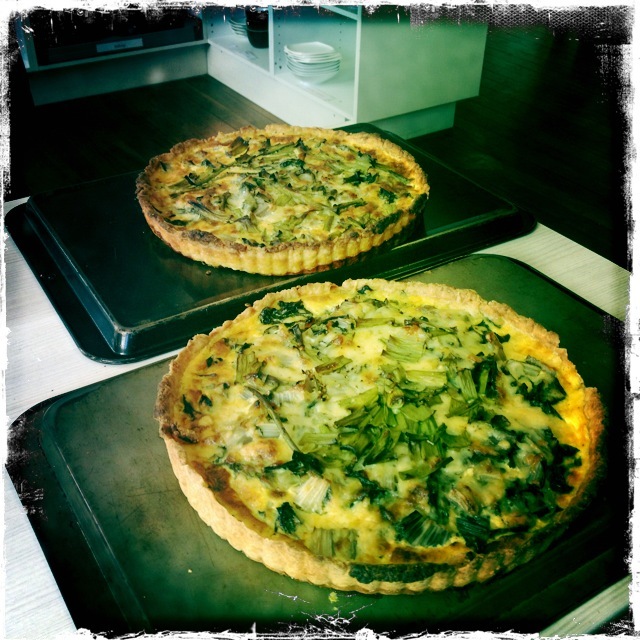 Ok, this week’s menu: the big hit is the return of our globe artichokes with lemon vinaigrette; also starring is soft polenta with broad beans and spring onions; a salad of wild rocket, fennel and green lentils; curly endive, silverbeet and parsley soup; and a quick-flipped fine herb omelette. Superyummy – the feathered girls are getting nary a look in! Recipes will be up here anon! 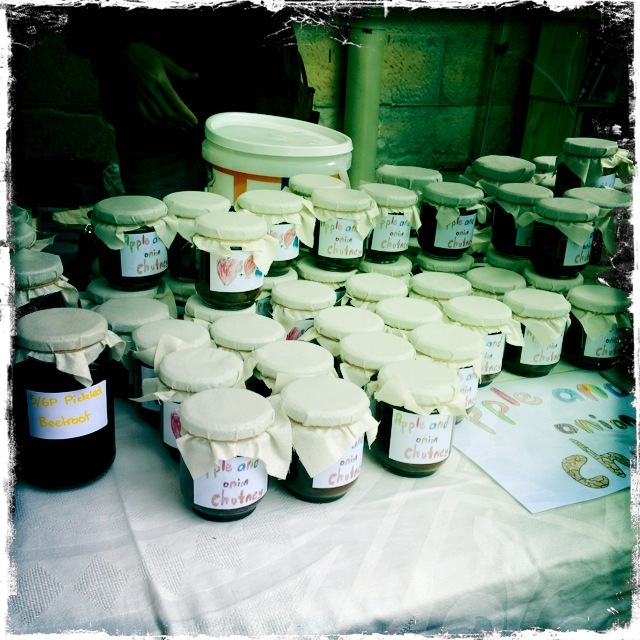 *The Bondi Makers and Growers market starts at our school next Saturday 17th November –come along and see me there: I’ll be there sizzling organic, preservative-free sausages and selling more jars of chilli jam! Nom nom. See you there! 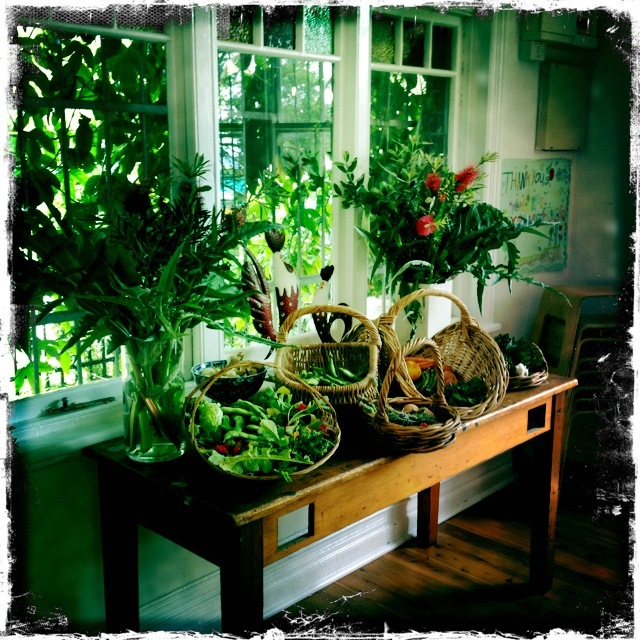 Hooray – our beautiful book ‘A Year In The Kitchen Garden‘ has arrived! After much, much work, blood, sweat and tears, Emma & Grace – parents at the school – proudly delivered their bouncing baby: ‘A Year In The Kitchen Garden’… a thick and tactile beauty chock full of wonderful photos of our kitchen garden, delicious recipes gleaned from prominent chefs and the school community (some with great illustrations from the children!) 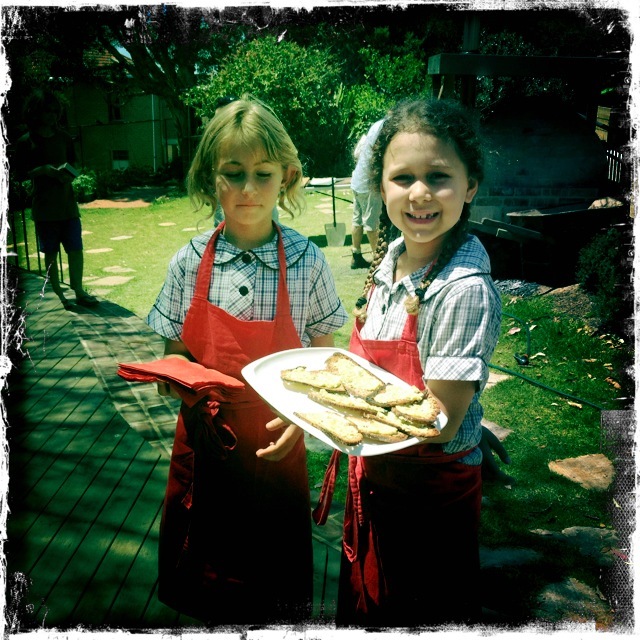 and also our day-to-day recipes prepared in the cottage… The most amazing parts of the book detail the process of setting up the program from scratch – what the parents did with the blank canvas of the school playground and how they transformed the cottage, organised the grants and motivated the workers. 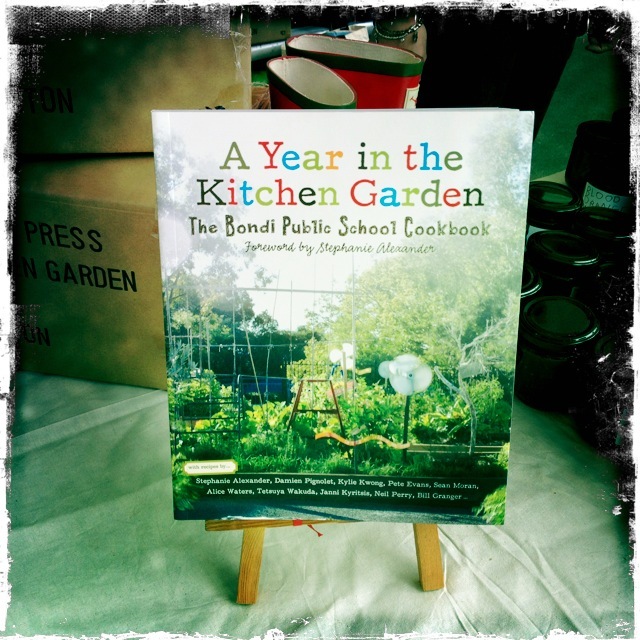 The story is truly inspirational & a must-have for any schools trying to start the program on their own – as well as being a great Chrissie gift for anyone remotely interested in food! Well done ladies! So I was greatly honoured to be asked to organise the book launch – Wednesday 31st October, a sit-down lunch for about 30 people. 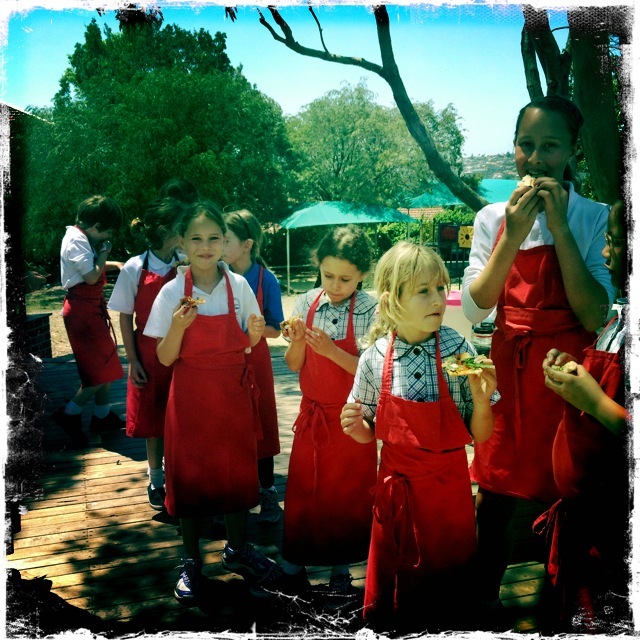 I had about a month to organise the roster and menu – notwithstanding preparing and bottling for the school fete held the weekend before – and eventually ended up galvanising 76 children and 27 adult helpers into action over 2 days of prepping, chopping, stirring, cooking, labelling, starting, finishing and serving! It was a massive job and results were gratifying. 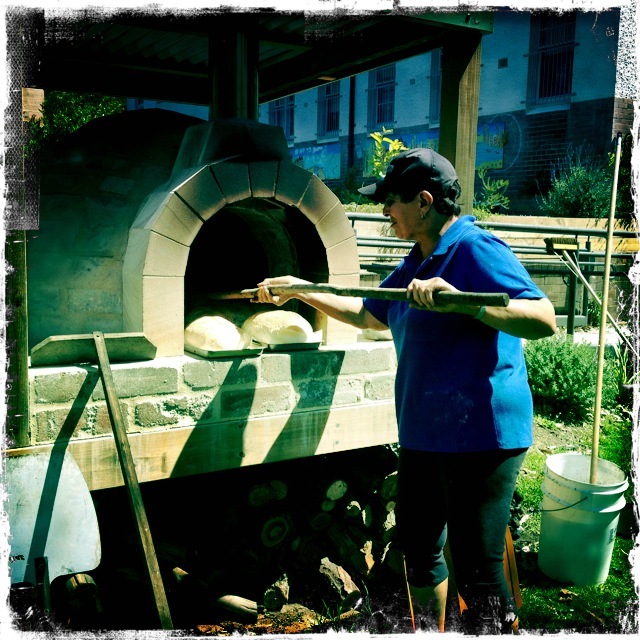 We also had the benefit of our new pizza oven in action too – Phillip and his mama Rosa came to help stoke the wood fire all morning and prepare bread for the lunch as well as cook our asparagus, the crispy kale, the grissini and the two different sorts of pizza…! 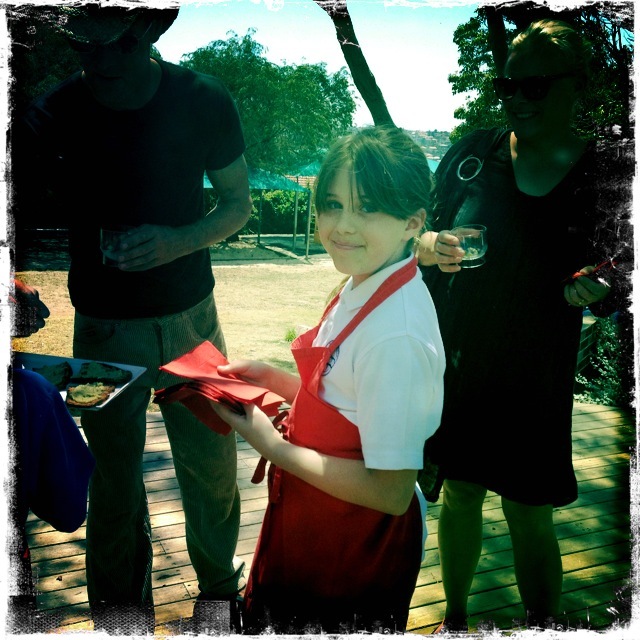 The day was a fabulous success, the children were absolutely wonderful in everything that they did, and were especially efficient and gracious waiters, and the VIP guests that attended (Kylie Kwong & Janni Kyritsis among the stars) were all suitably blown away by the professionalism! 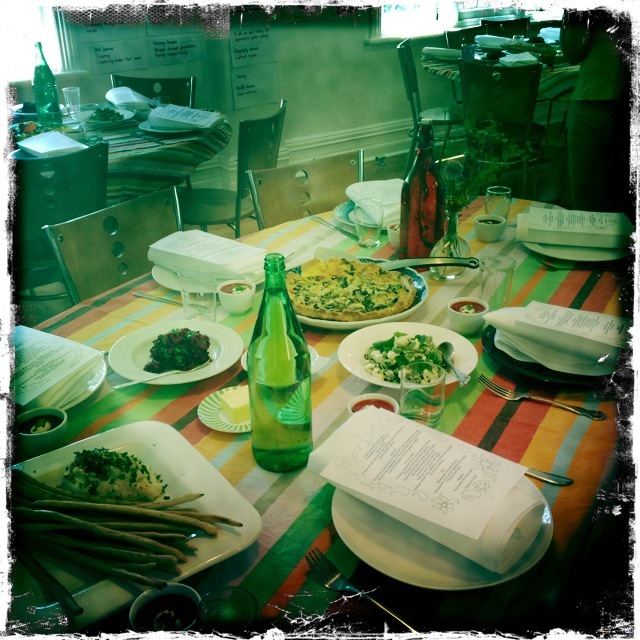 The food was so delicious, we made heaps and it all got eaten! 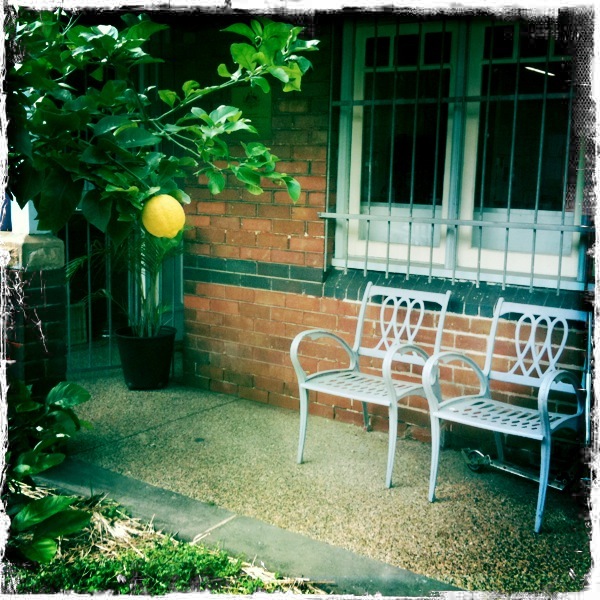 So here below, some more photos and links. Salute! The Sydney Morning Herald article on the launch, with a great photo! Grease the cupcake moulds with a little butter or simply drop a paper case in if you have them. Snip the lavender flowers from the stalks. Wash and carefully dry the flowers. Measure the sugar into the bowl of the stick blender, add 2 of the lavender flowers and blend together. Transfer the mixture to the stand mixer. Measure the flour and then pour into the sifter. Sift the flour into the mixture. Using a large metal spoon, gently fold the flour and buttermilk or yoghurt into mixture. Spoon into prepared baking pan and smooth top. Bake for 20 minutes until a skewer inserted comes out clean. Stand for 5 minutes before turning cake out onto a wire rack. When cool, divide among serving plates. Measure out the icing sugar into the sifter and dust the cakes, sprinkling on the extra flowers too. Serve each plate of cakes with a little bowl of thick cream if you want. 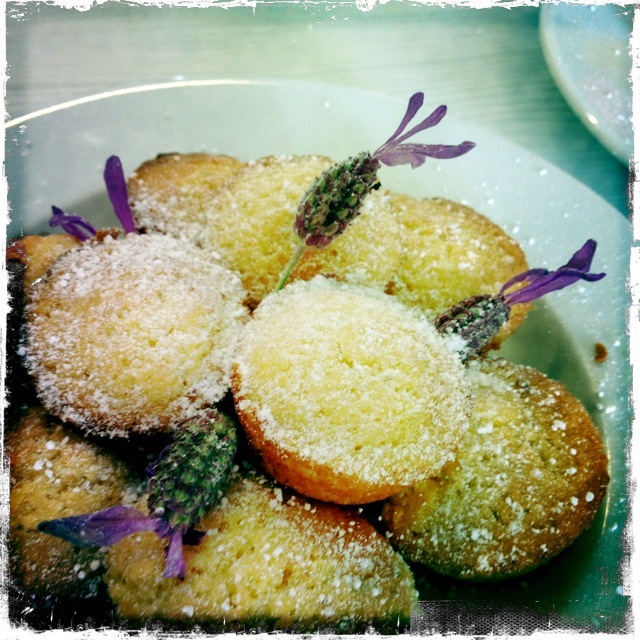 Notes:What else can you make with lavender? What is buttermilk? Why do we gently fold the flour and buttermilk in to the batter? This recipe is a ‘sister recipe’ to the Cornersmith Salad. The aim of this recipe is to use up the excess vegetable parts – carrot tops, fennel tops, spinach stems, parsley stems etc. The recipe can be varied with the seasons by adding what you have on hand. Wash the jars and lids in hot soapy water, rinse well and drain upside down. Place all the jars onto an oven tray, right side up, and slide into the oven to sterilize for 15 mins. Dry lids with a clean piece of paper towel. Wash (and scrub if needed) all the vegetables and herbs. Peel the onion & garlic, and carrots if needed. Using the large knife, chop all ingredients into medium sized chunks. In a large bowl, mix the ingredients thoroughly with the salt so it is mixed in evenly. Process into a thick paste. Fill the jars and seal tightly. Notes:This is used as a replacement to stock: one or two teaspoons dissolved in 500ml boiling water. It can be added to stews and soups or any meals that need a boost of flavour. Bouillon will last for 6 months unopened and stored in a cool dark place. Once opened,it will last for 3 months in the fridge. Crunchy? Herby? Garlicky? Yup, ticks all the boxes… yum yum yum! Hooray for spring! Preheat oven to 220C. Line a baking sheet with baking paper. Wash the asparagus and trim the woody ends into the compost. Slice the asparagus in half to make short stubs. Finely grate the parmesan to yield about ¼ cup. Separate the egg whites from the yolks into a medium bowl and gently whisk. (Reserve the yolks for the aioli). In alarge bowl add the panko, sift the flour, the grated parmesan, a pinch of salt and pepper and stir. Roll a few of the asparagus in the egg whites, drain off any excess and then roll in the panko mixture to coat. Place on the prepared baking sheet and repeat with all the asparagus. Pop into the preheated oven and bake for 15-20 minutes turning the asparagus half way through, and continue to bake until the outside is lightly golden. Let cool for a few minutes before serving. 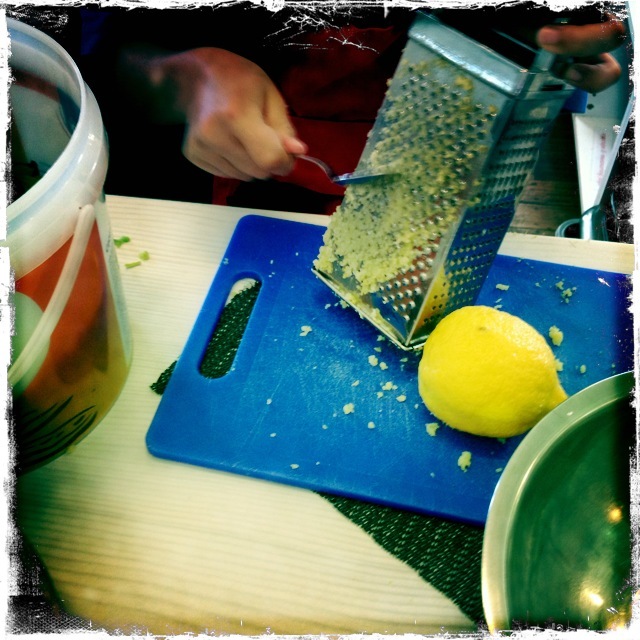 Zest the lemon and then cut it in half and juice the halves. You will need 50ml lemon juice in total. Smash the garlic cloves, peel them and squeeze them through the garlic press. 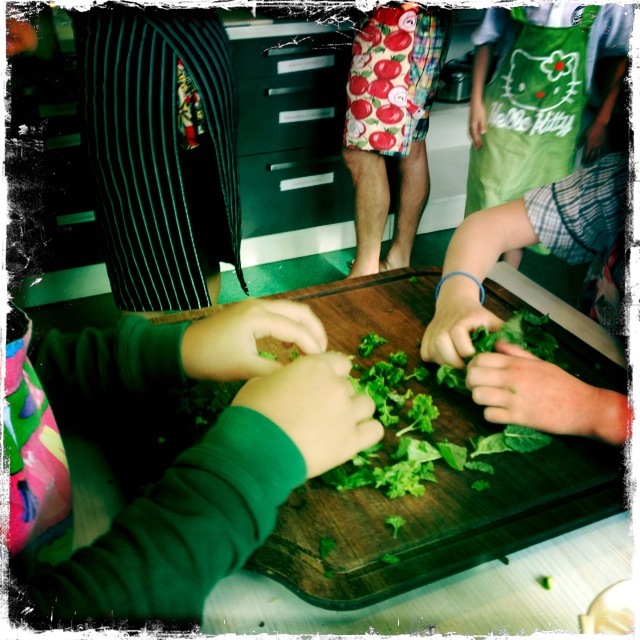 Wash the herbs, spin them dry, strip them and finely chop. Into the stick blender cup add the whole egg, the egg yolks, the mustard and only 20ml lemon juice. Whizz together until all is combined. Measure the rice bran oil, then get a friend to help super-slowly stream in the oil into the egg mixture while you are whizzing(this takes a few minutes so don’t rush it). To make this mayo into an aioli, slowly add in the remaining 30ml lemon juice, the zest, the pressed garlic, the chopped herbs and a good sprinkle of salt and pepper. Blend until smooth. Divide the asparagus among your serving plates, then drizzle a little pool of aioli onto each. To eat: pick up an asparagus spear with your fingers, scoop up some aioli and eat!